​ villages, campgrounds, trailer parks, farms, or anywhere you may go when in an emergency. Designed to produce safe drinking water in any type of emergency, this system is able to purify fresh water from wells, boreholes, lakes, ponds, rivers, swimming pools, questionable city treated water or storage containers. Note: These systems are not intended seawater desalination. When a crisis hits your area and corrupts your drinking water supply, rest assured with our Portable Emergency Water Purification System in your hands. Whether a power outage leaves you unable to draw water from your well, or a flood or hurricane contaminates the city's drinking water supply, or an earthquake damages your plumbing, this advanced Nanofiltration water purification system will deliver purified drinking water from almost any water source. And when you are forced to evacuate because of an emergency, easily take our Portable Emergency system with you to wherever you may end up. 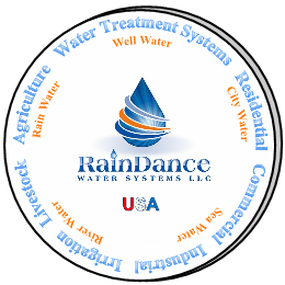 Our Rain-TPC Portable Water Systems are perfect to use in homes, villages, campgrounds, trailer parks, farms, or anywhere you may go when in an emergency. 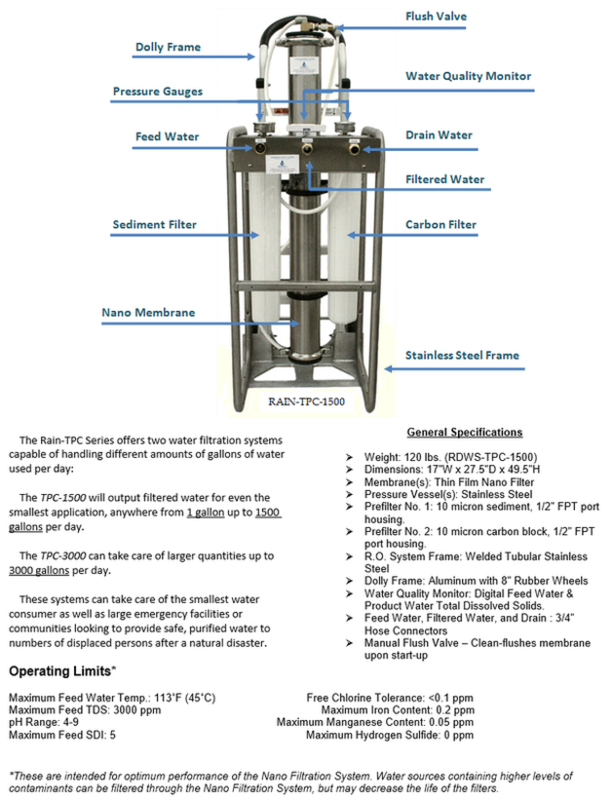 The Rain-TPC Water Systems offer a unique portable filtration able to reduce or remove multiple contaminants from many different water sources. Featuring Nano Membranes, water is forced through a semi-permeable membrane that captures 80-90% (nominal) of contaminants. Nano membrane filtration capabilities exceed expectations for purified drinking water in cases of emergency. Our nano membranes provide high productivity performance while filtering and reducing a high percentage of salts, nitrates, sulfates, tannins, fluoride, hard water, bacteria, viruses, chlorine, and organic compounds such as pesticides, herbicides, insecticides, THM precursors, and more, all without the use of chemicals or added salts. ​​Portable Nano-Membrane Water Purification Systems - On Sale Now! The Rain-TPC Water Systems are known for their true portable design and ability to produce larger amounts of water to accommodate many who may need emergency drinking water, while having an easy-to-use operating procedure – simply connect standard garden hoses to operate. Our specially-designed nano membrane provides both softening and filtration with one piece of equipment, eliminating the worry of multiple water problems. With non-electric options available, this filtration system is the perfect solution for when you're left without power, but if water pressure is lower than required, our electric systems are easily powered with a generator. To better prepare for a disaster, use this system to fill water tanks, water bottles and containers, and other storage options before a crisis occurs. The Portable Rain-TPC Systems include a welded all stainless steel frame and pressure vessel, integrated aluminum dolly cart with 8” wheels, dual 2.5” x 20” sediment and carbon block prefilters, prefilter in and out pressure gauges, 4”x40” special membrane filter element(s), Easy-to use ¾” standard hose inlet feed water, outlet filtered water and drain water connectors, digital electronic water purity monitor for feed and product water, and combined flow restrictor/membrane flush valve. The pressure gauges provide an indication of prefilter condition and feed water pressure while the water quality monitor shows the mineral content of both feed water and product water allowing verification of proper membrane operation. Nanofiltration (NF) is a key factor in the Rain-TPC Water Purification Systems. A nanofiltration filter has a pore size around 0.001 micron. Nano Membranes provide high productivity performance while reducing a high percentage of salts, nitrate, and organic compounds such as pesticides, herbicides and THM precursors. The low net driving pressure NF membrane allows the removal of these compounds at low operating pressures. NF also removes hardness from water, which accounts for NF membranes sometimes being called “softening membranes”. NF is an attractive alternative to lime softening or zeolite salt regenerating type softening technologies. Another important feature on these systems is the water quality monitor. This unique element offers the ability to display product water quality directly, a feature many simple water filter devices do not have. If this water quality monitor reads in the normal product quality range, it is a good indication that bacteria, organics and other contaminants are not getting through the membrane. As an Emergency Water Purification System, our Rain-TPC Series is able to sit in storage until needed, but it should be flushed by turning it on for 5 or 10 minutes about every six months just to keep the membrane clean and ensure that it operates properly. Depending on how often the system is used and the quality of the water it's filtering, the membrane and filters may be replaced less often.